The 2017 Fly Kansas Air Tour lifted off Thursday, September 28, on a three-day, 10-city celebration of Kansas aviation. At the close of their tour, pilots from across Kansas will touch down in Pittsburg. More than 30 aircraft and 40 pilots are expected to participate in the aviation tour taking place 10:30 am – 12:30 pm Saturday, September 30, at Atkinson Municipal Airport. This year’s tour, presented by the Kansas Commission on Aerospace Education and the Kansas Department of Transportation, promotes STEM (science, technology, engineering, math) education, and highlights the benefits of local airports to their communities, Kansas and the nation. The tour focuses on raising awareness on the importance of community airports and introducing aviation to young people. More than 150 students are expected to visit the Pittsburg airport during the tour. This is the fourth consecutive year for the revived tour, which first took place in 1928. The goal of the first tour was to promote the fledgling aviation industry in Kansas. The air tour is an opportunity to promote Kansas aviation and share the message that aviation is open to all. 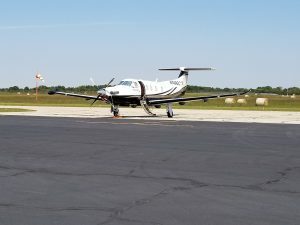 The public is encouraged to visit the airport during the tour to see the airplanes up close, talk to the pilots, and learn about the role of aviation in Kansas. This event is free and open to the public. The City of Pittsburg will provide a hot dog lunch with chips and water. The tour cancels in the event of inclement weather. For more information, check out our calendar of events page!